Not smart in any way, and filled with cheap special effects and corny dialogue, this movie is still a lot of fun in the most B movie of ways. This one isn’t nearly as much fun as the first Mortal Kombat film, but the action and effects are fun (in the kind of way where you often laugh at them,) and when it comes to mindless entertainment, this one is definitely makes an effort to keep itself afloat. If you are, or were ever, a fan of the games, then there are some definite likable qualities to this movie. For one, it tries very hard to make references to the characters and weapons of the game, whenever it can. For another, the sets, (computerized as they are,) definitely add to the environment. There isn’t much of a story here, but that’s to be expected. The dialogue is as corny as ever, and the effects do look like cheap drawings, but that just gives the viewer more to laugh at. We’ve come a long way in the world of special effects since this movie was made, and watching the film really shows that off. 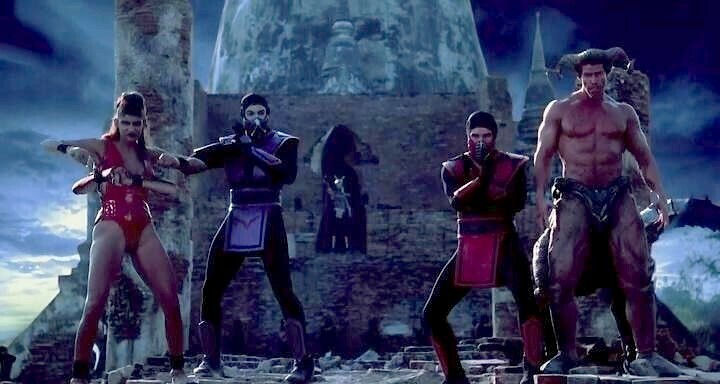 You don’t get more fun B movie entertainment than you do from these Mortal Kombat films. Mortal Kombat and Mortal Kombat Anihilation are both not very good movies. But they are fun. They are both campy as hell and unapologetic about their corny characters, dialogue, and plot devices. And they both feature some decent action and fantastic sets. In the grand scheme of things, saying the sets are good as one of the only real positive attributes about a movie would seem like a back-handed compliment or a joke. But here, when the entire movie takes place in another world, the sets are filled with creative environment and atmosphere, and they actually do make a huge difference. And then, of course there’s the music, featuring the killer Mortal Kombat song. All these things come together to make the film entertaining and a good deal of dopey fun. The movies are based on the popular video games from the nineties where one player and character would fight another, in a tournament of round after round. This is one of the games (along with Street Fighter,) that pioneered that type of single player fighting game, which ended up turning into a genre. Video games are still being made that follow the very same rules and structure today, (such as Injustice: Gods Among Us.) But with Mortal Kombat, just like with Street Fighter, we weren’t looking at spinoff characters and material that came from somewhere else. This wasn’t Marvel Vs Capcom or Injustice which both featured characters from popular comic books. With these games, the characters and stories existed solely for the purpose of the games, and nothing more. They were completely original to the games themselves. Mortal Kombat, in particular, made up a whole storyline about a tournament in another world where the greatest fighters of earth were invited to compete, in order to save the future of the planet. Unlike the Street Fighter movie (with Jean Claude Van Damme and Raul Julia, although there have been other attempts at making this game into a movie, such as the one with Chris Klein,) the material in the Mortal Kombat movie stayed pretty close to that of the game. The movie really was about a tournament and different rounds and this place called Outworld, where the tournament took place. It really was about Shang Tsung and the souls of dead warriors he had collected over the years. That first movie featured lousy dialogue and characters, but it sure did have the right spirit and energy. The follow up film, Mortal Kombat: Anihilation, isn’t nearly as good. Not that either film is anything great, but there’s a significant drop off between the first film and the second. For one thing, the second movie makes the cardinal mistake that the Streetfighter movie did, which is that it deviates entirely from the storyline of the game. Mortal Kombat Anhilation is in no way about a tournament. 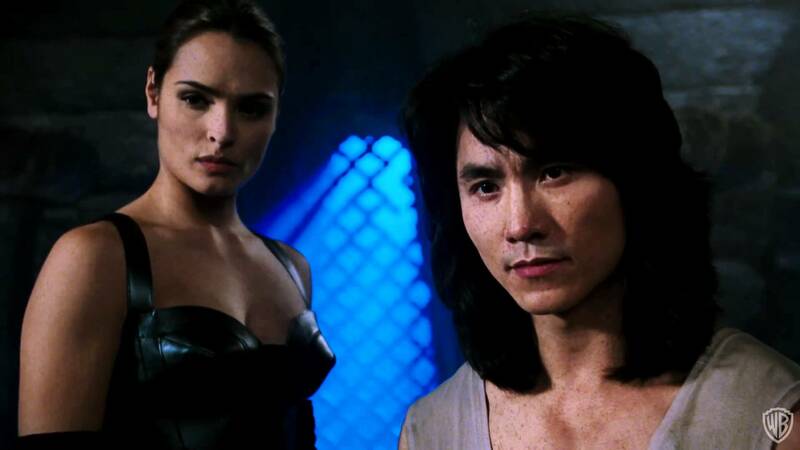 Instead, it’s about the new baddie, Shao Khan, trying to conquer earth by closing the realm and passage that can prevent it from being conquered, and defying the gods and the rules of Mortal Kombat in order to do it. The good character, once again led by Rayden, are all sent in different directions in order to prevent this. But the only real one of these paths worth noting is that Rayden himself goes to speak with the gods and lets them know what Shao Khan has done and how he has defied their rules. The irony is that when he finally does get there, the gods don’t really care. They say, whatever Shao Khan or Rayden figure out amongst themselves is okay by them. While the storyline to this movie is pretty bad, one thing that is indeed pretty cool is the way the film begins right after the ending of the first movie. It feels like a real continuation with the characters celebrating their victory from the first movie when a new villain appears in the sky. This villain is Shao Khan. He shows up wearing a skull mask, the same kind that he wears in the video game, and then for some unexplained reasons, for most of the movie, he does not wear that mask at all. Instead, he turns out to look just like a human, and have real human issues including a father who looks down on him, and who he constantly tries to impress, and a brother who has chosen another path than the one set out by Shao Khan and his father. A beloved character from the first movie dies in the opening scene, (but not before we get to see one of his cool signature moves,) and from there, it’s just the three main characters left, (Sonya Blade, Lieu Kang, and Rayden,) as well as the character who they rescued in the first movie, Princess Kitana. As it happens, one of the villains who is under Shao Khan’s control is Kitana’s mother, Sindel. Apparently she died some time ago, at the hands of Shao Khan, and now he has resurected her in order to fight for his army and cause. The truth about Sindel is that she might actually want to be released from Shao Khan, and not want to walk the earth this way, in an undead form. That’s about as much as this plot has to offer. We get mentions of characters from the game like Kabal and Stryker, and then it’s up to our leads to go find some of the other characters. Sonya has to find her partner, Jax. Lieu Kang and Princess Kitana have to ride around in a giant hamster ball that transports them through underground tunnels. This is something that wasn’t even in the games. When Sonya finds Jax, he is waking up from a surgery. Jax has just replaced both of his arms with giant metal ones. This was one of the coolest features of the video games, but here, his metal arms look so fake and rubbery that they don’t look or feel like metal at all. At least they weren’t computerized (remember Wolverine’s drawing claws in X-Men Origins: Wolverine?) Thinking of Jax’s arms in comparison to this, I guess his arms could have been a lot worse. The characters now go off to fight against villains, one at a time. Sonya and Jax are attacked by a black robot, (Smoke, from the games.) Then later they come across a female Ninja who Sonya mistakes for Kitana. That’s kind of funny, because one thing the games did is it varied the appearance different characters by simply changing their colors. This started in the first game with Sub Zero (blue,) Scorpion (yellow,) and Reptile (green.) See the picture above and notice the red and blue Ninjas as examples. After the first game, we were given different ninja warrior girls, each with a different color and different weapon. And finally it was the different robots. All looking exactly the same except for in color. One was yellow, another red, and another black. And the movie has fun with this idea when Sonya can’t even tell the difference between this enemy and a member of her own team. One thing cool about this movie is that it tries to bring in as many ideas from the games, (in terms of weapons and characters,) as possible. From Night Wolf appearing briefly, just to give some guidance, to Sheba, the four-armed woman, appearing to bicker, but never fight, characters appear, but often are not used to their potential. Even Sub Zero, claiming to be the brother of the character in the first movie, is now a good guy who looks nothing like the other character. Characters show up out of nowhere. just to have quick fights and then disappear, (like the monster Baraka.) If you’re a fan of the games, or ever were one, then spotting the references can be a lot of fun. Otherwise, there’s not really much point. The storyline about the family unit that falls apart, and way the two brothers (Shao Khan and his counterpart on the good guy team,) now oppose each other is pretty dumb. But you don’t watch these kinds of movies for story. You watch them are action and ridiculous special effects. You definitely get those things here. The effects are so bad, in fact, that they make the special effects from the first film look great, (that first movie had the creativity to use a puppet for Goro, for example, instead of going full CG like this one does. Still, if you want monster drawings that are brought to life in some of the goofiest ways, this one works. And when it comes to laughing at movies, this one serves as a good bit of fun. It is a B movie at best, but on a mindless level, it is kind of entertaining.